I've heard it said that mixed feelings, like mixed drinks, confuse the soul and mind. So I don’t know whether to hail or wail tomorrow’s international pledging conference for Syria in Kuwait City. Hail, because over four million people are in need of assistance in Syria, half of them in Aleppo, Homs and Rural Damascus, plus another 704,314 Syrian refugees in neighboring countries and North Africa. Wail, because UN fundraisers have already earmarked at least a third of the required humanitarian response for the next six months to President Bashar al-Assad’s tentacles. Tomorrow, heads of state and representatives from UN agencies and non-governmental organizations will gather at Bayan Palace in Kuwait City to attend the first-ever high-level International Humanitarian Pledging Conference for Syria. The one-day conference will give member states an opportunity to continue supporting the much-needed humanitarian response. So far, only a small percentage of the funding has been received, limiting the ability of UN agencies and their humanitarian partners to reach people who desperately need help. Hosted by Kuwaiti Emir Sheikh Sabah al-Ahmed al-Sabah and chaired by UN Secretary-General Ban Ki-moon, the conference will address the funding gaps for the Humanitarian Assistance Response Plan (HARP) for Syria and the Syria Regional Refugee Response (SRRP). Together the plans seek $1.5 billion to assist millions of civilians affected by the Syria war over the next six months, including those inside the country as well as many others taking refuge beyond its borders. About $1 billion is for the SRRP, which will support more than 700,000 refugees who have fled Syria to Jordan, Iraq, Lebanon, Turkey, Egypt and Algeria. HARP requires more than $519 million to help over four million people inside Syria, including an estimated two million internally displaced persons. Problem is the UN Office for the Coordination of Humanitarian Affairs (UNOCHA) has unashamedly said all humanitarian assistance is, and will continue to be, delivered “with full respect to the sovereignty of the Syrian Arab Republic” during the implementation of this Response Plan. “This Humanitarian Assistance Response Plan aims at supporting the Government of Syria’s efforts in providing humanitarian assistance to the affected populations. It will cover the period from 1 January 2013 until the end of June 2013. The financial requirements amount to $519,627,047,” according to unocha.org. I wonder if UN budget planners had the wisdom of consulting Assad about his own destruction chart for the next six months to at least work in synch. 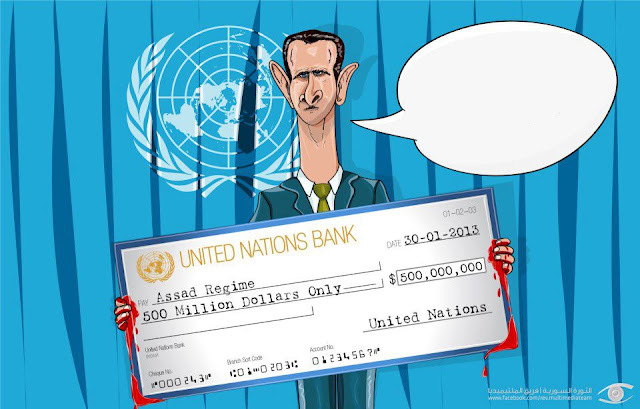 The Syrian Expatriates Organization (SEO), the Union of Syrian Medical Relief Organizations (USMRO) and the Syrian Americans for Democracy (SAD) have all deplored the UN decision assigning Assad’s government to manage the humanitarian aid inside Syria.